Salvage workers have refloated a 220ft-long (67m) crane barge which was grounded on a Kent beach after she took on water on the approach to Dover. Divers were inspecting the hull of the Goliath to ensure she was seaworthy before she was towed to Moerdijk in the Netherlands. The Maritime and Coastguard Agency (MCA) said it is believed water entered the Goliath through a vent cover. A spokesman said it is thought the cover was not properly closed. Dutch salvors Multraship were on the scene since the Goliath got into difficulty on Friday. The MCA said the vent had been sealed and the affected area on the port side of the vessel patched up. The unmanned barge was being towed from Belgium to Ireland by the tug Sea Alpha when she began taking in water. The tug's five-man crew grounded her on a beach at Walmer. The Goliath was carrying 130,000 litres of fuel oil, along with other lubricants and hydraulic oils, used to power the generators needed on board the vessel to work the machinery. The Environment Agency said the tanks were intact and no notable spills or leaks had been found. 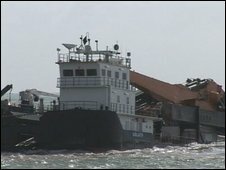 The Maritime and Coastguard Agency confirmed that the barge, which beached between Deal and Kingsdown, presented no threat of pollution.